Enabling communication with TEDS sensors over USB port of Windows PC, Model 400B76 features graphical interface that allows user to read TEDS from, and write TEDS to, sensors with single mouse click. Principle types of transducers supported include single axis and triaxial accelerometers, impact hammers, impedance heads, charge amplifiers, microphones, and microphone preamplifiers. Kit is invaluable for reading, verifying, and updating TEDS sensor information and format. 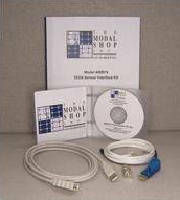 The Modal Shop introduces its new version of the TEDS (Transducer Electronic Data Sheet) Interface Kit - Model 400B76. The 400B76 offers the capability to communicate with TEDS sensors over the USB port of a Windows PC. An intuitive graphical interface allows the user to read TEDS from, and write TEDS to, sensors with a single mouse click. Model 400B76 supports multiple IEEE 1451.4 compliant TEDS sensors as described by the IEEE Instrumentation and Measurement Society (IEEE Std 1451.4(TM)-2004). Principle types of transducers supported are single axis and triaxial accelerometers, impact hammers, impedance heads, charge amplifiers, microphones, and microphone preamplifiers. Model 400B76 supports IEEE 1451.4 templates plus IEEE preliminary templates (also referred to as IEEE P1451.4, version 0.9). These include IEEE transducer templates numbered 0 to 28, as well as manufacturers' templates such as the geometry formats established by LMS International. The 400B76 is an invaluable tool for reading, verifying, and updating TEDS sensor information and format, including calibration information, ensuring smooth operation of the transducer with your favorite data acquisition equipment. THE MODAL SHOP, INC. offers many unique structural test products and accessories. TEDS rentals are available. For specification sheets, application data, competitive product upgrades, pricing or to schedule a rental, please contact THE MODAL SHOP, INC., 3149 E. Kemper Road, Cincinnati, OH 45241-1516, Internet: www.modalshop.com, (800) 860-4867, Fax (513) 458-2172 or e-mail: info@modalshop.com.